Upcoming Andes Events! | Andes Works! There are many fantastic things going on around town this summer and throughout the year. Join Andes Works! members on paddles, hikes on new trails in town, at musical performances and more. See what else is up in Andes! The Hunting Tavern Museum & Gift Shop opens for the season! Join Andes Works! and Catskill Mountain Club Board Member Ann Roberti to kick off this year’s reservoir paddling season by paddling the beautiful Pepacton Reservoir. Provide your own CANOE or KAYAK or rent from a local business. We will launch promptly at 11AM at the Shavertown Bridge site on the Pepacton Reservoir. Life jackets required. All boats must be steam cleaned prior to arrival on site and have a valid DEP access sticker. For more information on regulations click here to visit the NYCDEP website. The ASHC is hosting an opening reception for the art exhibit by the regional Plein Air group, at the HTM. Come and view the works of our local artists and enjoy the refreshments! National Trails Day hike with Andes Works! See the Andes Rail Trail and the new Bullet Hole Spur hiking trail. The whole trail is now 3.9 miles round trip – come and see all that the trail has to offer. The Tremperskill Boys are an old time string band whose core repertoire comes from fiddle tunes now native to the Catskill Mountains. It’s a special event for all ages! Andes Presbyterian church, 4 to 8 pm. Nothing says summer like strawberry shortcake! Come sample tons of strawberry tasty delights prepared by the Andes Presbyterian Church. Andes Battle of the Bands! 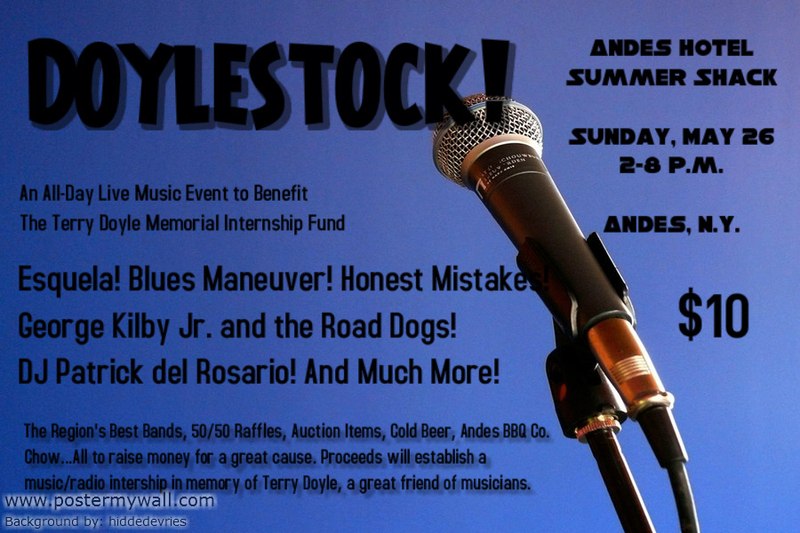 Building on the success of last year’s event the Andes Battle of the Bands 2013 will broaden it’s scope by inviting musicians of all ages and experience to participate. First Round of competition is held from 2pm to 5pm. The 4 bands chosen from this round go on to battle in the Final Round – broadcast LIVE over WIOX Community Radio 91.3FM from 6pm to 8pm. 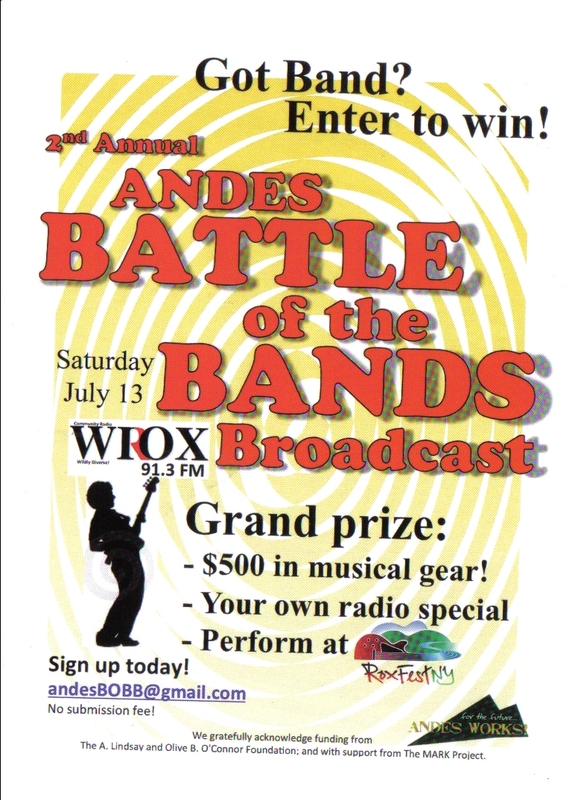 The Grand Prize: Perform at RoxFest,NY + $500 Musical Gear + Your Own one hour Radio Show on WIOX! GOT BAND? Contact andesbobb@gmail.com for more info. All Day– Starting at 10am with a parade, exhibits, over 30 vendors, live music, tours of the historic Hunting Tavern, and hay rides. Come enjoy a variety of events for the family while strolling the streets of Andes in the heart of the Catskills, with many great restaurants, antique and gift shops and art galleries. The Andes Society of History & Culture is sponsoring “Reservoir Towns Day” at the Pleasant Valley Meeting House. Dish-to-pass meal at noon or shortly thereafter, many historical exhibits and lots of reminiscing at the dining hall. The film, “Beneath Pepacton Waters,” will be shown in the meeting house. 10am to 4pm- Andes is hosting a town wide yard sale on Sept 10th! If you are a resident, empty those attics and make some money! If you are a yard sale goer, you are not going to be disappointed here! Andes residents are known for hanging on to some wonderful treasurers! 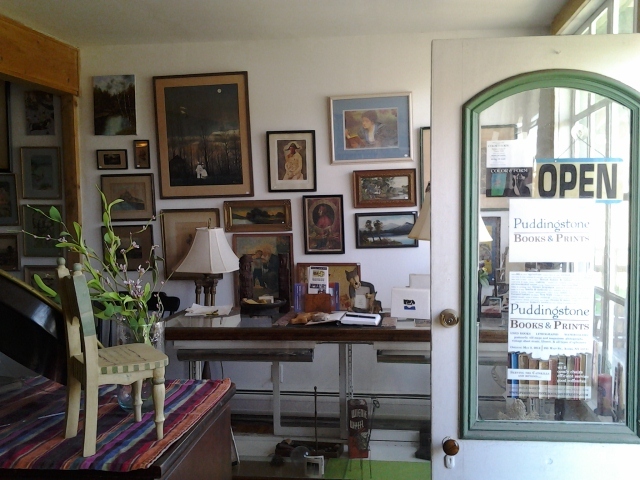 While you are here, pop into the Andes Hotel for the chili cook-off or browse through some of Andes unique shops and galleries! Andes Society of History & Culture General Meeting –, 6 p.m. — The ASHC fall general meeting and dish-to-pass supper will be held at the HTM. The program will be announced as the date approaches. 5 p.m. — The ASHC will hold its annual “Soup and Bread Night” at the HTM, following the tree lighting in Bohlmann Park. Come and enjoy a wide variety of delicious homemade soups and breads, a variety of hot and cold beverages and some good conversation! Call Vera and Don Liddle for more information at 845-676-3345. There’s lots going on in area businesses too. 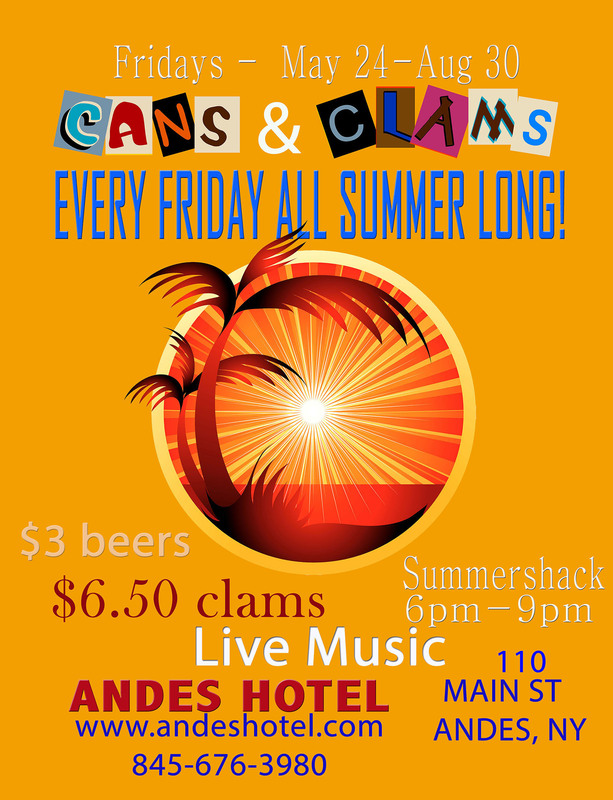 The Andes Hotel always has something wonderful cooking – literally and figuratively – The Craft Beer Festival, Trivia Nights, Doylestock, Karaoke Nights, and the summer long Cans and Clams with live Music. 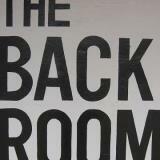 The Back Room at Hogan’s is an amazing surprise… Gourmet meals at the gas station. If you haven’t tried it, check it out – dinner Friday, Saturday and Sunday and Sunday brunch. SIXTY ONE MAIN GALLERY — 61 Main St, Andes, NY — offering a rich collection of contemporary fine art, Sixty One Main reopened this weekend celebrating its sixth season with a collection of Oil Paintings by Kate Knapp, Plein Air paintings by Robin Kappy, Abstracts by Jim Chatelain, John Egner, James Walton Fox , Gary Mayer and Lynn Preston and Wood Block Prints and reproductions by Sandy Swan. Andes Works! OWN Michael Suchorsky is performing at the Andes Hotel June 1st from 6-9 pm. Do not miss Andes Battle of the Bands!! 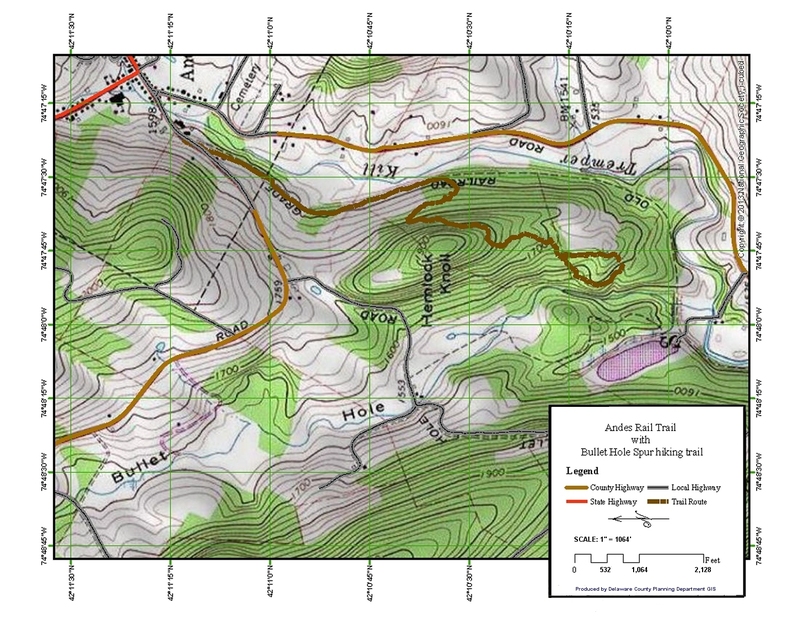 The Andes Rail Trail has been expanded with the opening of Bullet Hole Spur hiking trail. The trail is now 3.9 miles round trip, and sports a lovely new arbor entryway. Join the Rail Trail Crew for a hike on the Trail June 1. 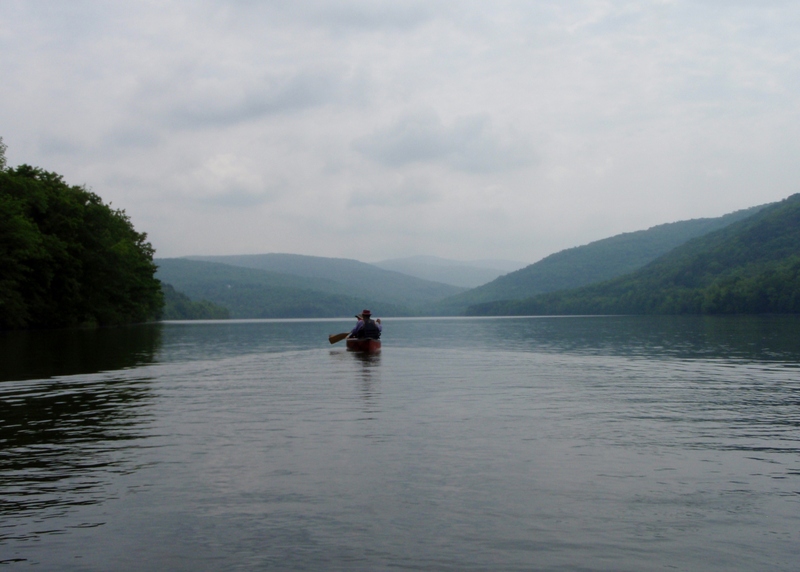 Friday, May 24th is the opening day for paddling on the Pepacton Reservoir. Read all about it in the DEP brochure. 2 Responses to Upcoming Andes Events!